Weighty Matters: PEI's Eastern School District discourages exercise? PEI's Eastern School District discourages exercise? Here's the story. There's this company out in Prince Edward Island (PEI) called UFIT. It was founded in 2002 and it aims to provide non-judgemental, safe places to promote exercise. 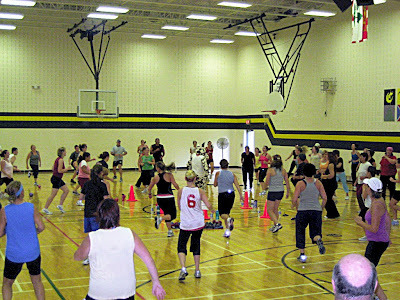 As evidenced in the photograph above, UFIT classes generally take place in school gymnasiums and everyone is welcome - from children where kids under 10 are free with parents, through to seniors and the cost to attend is/was only $5/class or $45/ten classes with each class lasting an hour. Well at least it did. You see PEI's Eastern School District is effectively shutting them down. Apparently local gyms complained that the rates the schools were charging UFIT to rent their gymnasiums impacted on their businesses. The Eastern School District's response? Despite the fact that there was no exclusivity to UFIT's booking of school gymnasiums, despite the fact that one might think the schools would want to encourage exercise, despite the fact that comparing group fitness classes held for an hour a day in a local school gymnasium to a full-on, all day gym is like comparing taking a night class in a community college with a carrying a full-course load in University, as of February 1st the school district's hiking up UFIT's rent, restricting UFIT to holding only 3 days of classes per week per gymnasium (down from 7), and banning UFIT classes during summer break, stat holidays, March break or storm days. Does anyone have a clue what this school board's thinking? Are they upset that UFIT's actually found a way to use school gymnasiums to effectively help keep people fit?